First freeze some cubes of rhubarb puree. Preheat the oven to Mk4, 180C (350F). Place all the ingredients in an ovenproof dish, stir through with a spoon then cover with foil or a lid and bake for 40 minutes till the rhubarb is soft. Pour the rhubarb into a sieve over a jug to drain off most but not all of the juice. Mash the rhubarb with a fork to make a soft puree and leave to cool. 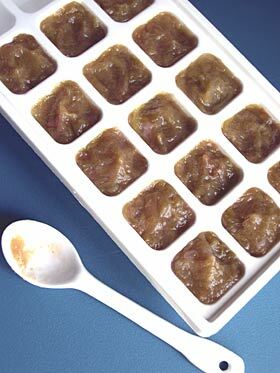 Spoon the puree into the compartments of an ice-cube tray and put into the freezer till frozen. The juice in the jug is delicious so don’t waste it. Stir it through softened vanilla ice cream then freeze to make rhubarb ripple ice cream or use as a cordial to make a Bellini-esque cocktail mixed with sparkling white wine or champagne if you want to push the boat out or dilute to taste with sparkling mineral water for a more modest but equally delicious drink. Preheat the oven to Mk6, 200C, 400F. Brush melted butter over a muffin tin. 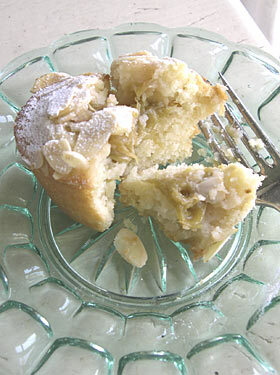 Sift the flour and icing sugar together and stir in the ground almonds. In another bowl whisk the egg whites till frothy but not stiff. Fold the egg whites and melted butter quickly into the almond mixture until just combined. 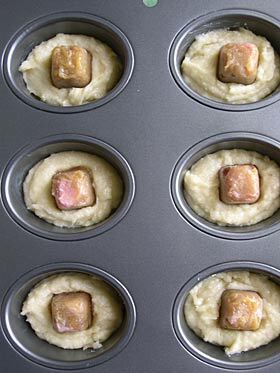 Half fill the muffin tins then push a puree cube into the centre of each one. This does look a bit peculiar! See the picture below. Cover the cubes with the remaining mixture. Don’t worry if the rhubarb isn’t completely covered as the mixture will rise up around the cube as it cooks. 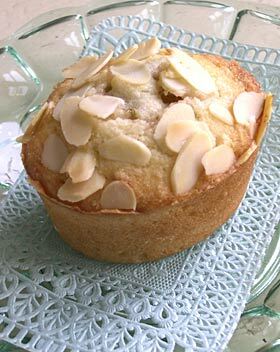 Sprinkle flaked almonds on the top of each one. Bake for 20 – 25 minutes. Take out of the oven and when cool enough to turn out, leave the friands to cool on a wire rack.